For my city trip to Amsterdam I thought about making a new bag. I took some pictures, so I can share with you step-by-step what I did. 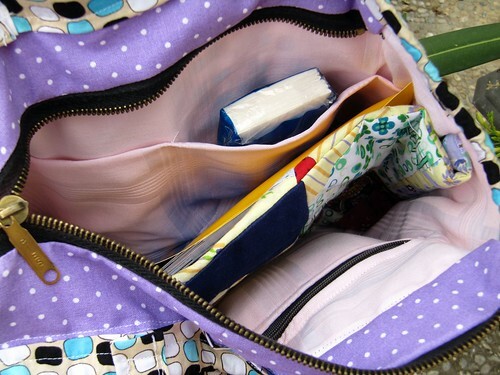 It has four pockets on the outside (two on each side), inside pockets, a divider and a zipper pocket inside. The bag will be closed with a zipper. 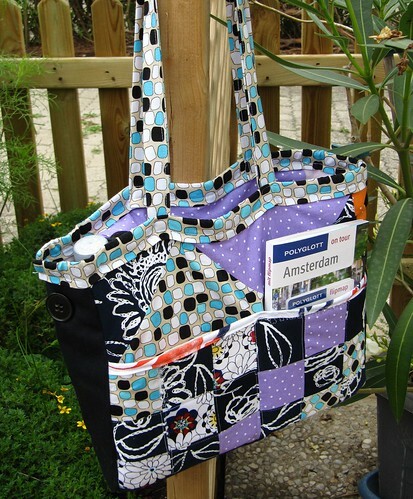 I used mostly my fabric scraps for the Amsterdam bag. First I sewed fabric squares together (3×6 squares) I needed for the outside pockets. I stabilized the finished piece of fabric with a piece of floorcloth (made of non-woven fabric) in the same size. Again, I added bias binding as finish. For the rest of the outside of the bag, I sewed triangles together and added a piece of cotton in the size of the piece of the outside pockets. Then I laid both pieces onto each other and sewed them together in the middle to form the two outer pockets. After doing this for both sides (1x front, 1x back), I cut the bottom of the bag and sewed it to the front and back part. In the same width as the bottom and the same height as the front and back piece of the bag (plus seam allowance) I cut the side parts. Then I pinned everything together, sewed it and my outer part of the bag was finished. My next step was the inner part of the bag. I wanted a zippered pocket, some side pockets and a divider. I measured the circumference of my bag and divided it by half. This was the width of my inner side pieces (plus seam allowance). The height of these pieces was the height of the outer side piece plus half of the bottom width. I stabilized the divider again with my non-woven floorcloth. On one side piece, I added side pockets. And on the other side, I made a zippered pocket (as explained here). Then I sewed my three pieces together accordingly. To shape the bottom of my bag flat, I matched the bottom seam line to side seam line, creating a flattened triangle. Measuring half the bottom width from point of triangle, I sewed a straight line and repeated everything for the other side. Now I only needed to add my zipper to close the bag to the inner part of the bag. 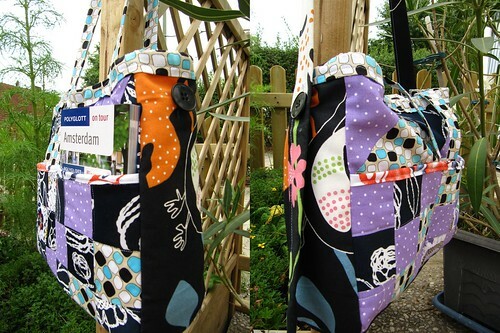 I sewed the zipper between two fabric pieces to match the depth of the bag. Then I put the inner bag into the outer bag and added some bias binding on top to connect both parts of the bag. I added a button on each side. There I can attach a longer handle (with buttonholes) if I want to wear the bag across my body.